I really wasn’t kidding when I said a couple weeks ago how insanely good that fresh raspberry buttercream is. My mind keeps wandering back to it, dreaming about other goodies that could benefit from that real raspberry yum. And this is what has evolved so far. 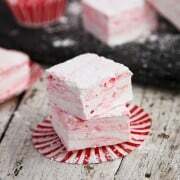 Raspberry Shortbread Hearts & Raspberry Cream Cheese Marshmallow Dip. Whew! That’s a mouthful of a title, I know. But it is what it is. Shortbread is not something I usually bake myself, but I always enjoy it when it’s set before me. And my brother-in-law’s chocolate chip shortbread cookies were my sweet tooth’s salvation when we went to visit family in Egypt last year. So I decided to get more acquainted with shortbread! The pretty colored dough was extremely easy to work with, soft and supple, almost like Playdough. Tessa had so much fun helping me cut out the hearts, that I gave her the last bit of dough to just play with. Over and over, she rolled it out, pressed in her cookie cutters, and proudly showed me each new heart. The cookies are softly raspberry scented and flavored. And when the dip is introduced, there’s suddenly alot more flavor and alot more fun! 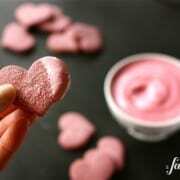 Pretty little berry hued hearts to dip into a mixture of cream cheese and marshmallow cream. Do you remember that famous fruit dip from years ago? It’s the reason I ate so much fruit from those trays at every family gathering when I was a kid. Seriously yummy. So here it is again, this time with some raspberry mixed in. 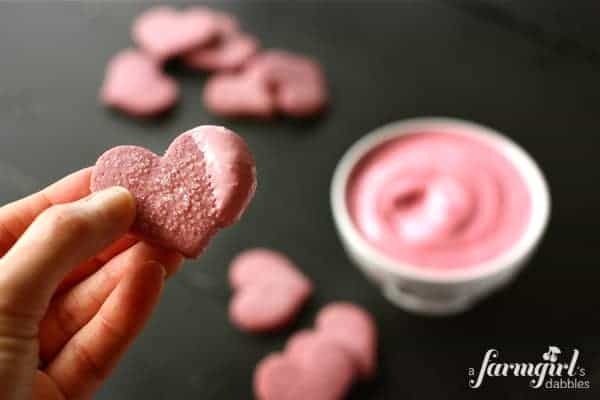 Together, these little shortbread hearts and dip make a perfectly fun and delicious Valentine’s Day treat. Cook the raspberries in a medium saucepan over medium heat, stirring frequently until the raspberries are broken down into a sauce. Lay a double layer of cheese cloth inside a fine mesh strainer and pour the raspberry sauce through it to remove the seeds. To get as much juice extracted as possible, I gather up the ends of the cheese cloth and then press on the gathered sauce with a wooden spoon. This will help to squeeze out the maximum amount of juice. Pour the raspberry juice back into the pot. Discard the cheese cloth with seeds. Simmer the juice over medium low heat until it reduces to just a 1/4 cup. It will be a very rich red and concentrated sauce. Set aside to cool completely. In the bowl of a stand mixer, beat butter and sugar until the mixture is a bit fluffy. Add in the flour and mix until incorporated. Add the cooled 1/4 cup of raspberry sauce and mix until dough is evenly colored. Dust rolling pin lightly with flour, and roll dough 1/4″ thick on a lightly floured surface. Using a heart-shaped cookie cutter (mine measured 2” wide by 1-1/2” tall), cut heart shapes out of the dough. Try to place your cuts as close together as possible so you won’t need to re-roll your dough as much. Place heart cookies 1/2” apart on ungreased cookie sheet (they don’t spread much at all when baking). I used a non-stick baking mat on the cookie sheet and it worked great. Sprinkle with course sugar to your liking. The cookies overall are not very sweet, so I sprinkle them fairly generously. Bake 13 to 15 minutes, or until set and edges start to brown very slightly. Adjust baking time for cookies of different thickness and/or cookie cutter size. Remove to rack to cool. Repeat the very same process of reducing the raspberries as you did for the shortbread hearts. You want to end up with the same 1/4 cup of reduced raspberry sauce in the end, completely cooled. Blend cream cheese and marshmallow cream with a hand mixer until fully combined. Add the 1/4 cup of raspberry sauce and mix until the dip is evenly colored. Chill until ready to eat. 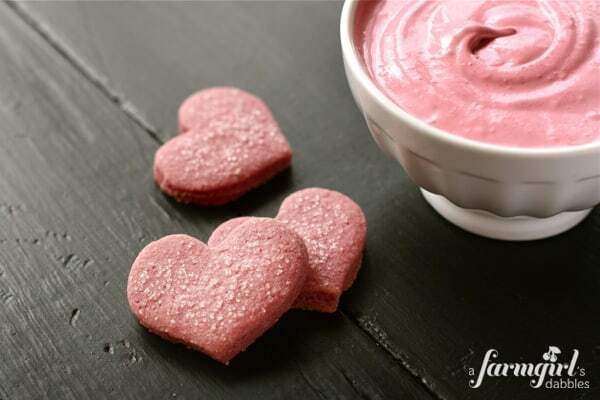 Serve dip with raspberry shortbread hearts for dipping. Fresh fruit also works great for this dip. Shortbread heavily adapted from Betty Crocker’s 40th Anniversary Edition Cookbook’s Scotch Shortbread recipe. Fresh raspberry sauce adapted from this Fresh Raspberry Buttercream, originally from Making Life Delicious. Hi! These look great! Was wondering how long they stay fresh. Planning to make them for my daughters party but have to make cupcakes too, so wanted to see if I can make them two days ahead? I think you would be fine to make these 2 days prior, Elle. Please let me know what you think of these! 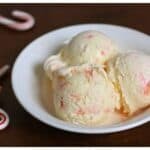 What a great recipe to try for Valentine’s day. I also love the photos too. These are SO pretty!! Love the pink…and the dip! Wow, so glad that worked for you. I would think it would be too loose to pipe on cupcakes. Did you thicken it at all? That fruit dip was only introduced to me as an adult, sad, I know. But since I’ve been introduced to it, I stinken love the stuff. And with raspberries in it, such a cute color and flavor! perfect to dip cookies int! Thank you, Julia. Hope you make up for lost cream cheese marshmallow dipping time!! So very pretty and perfect for Valentine’s Day. Thanks, Sylvie. I love how sweet and petite they are, just the perfect little nibble after a meal. These look delicious. Can I have some? Thanks, Sarah – nice to meet you! 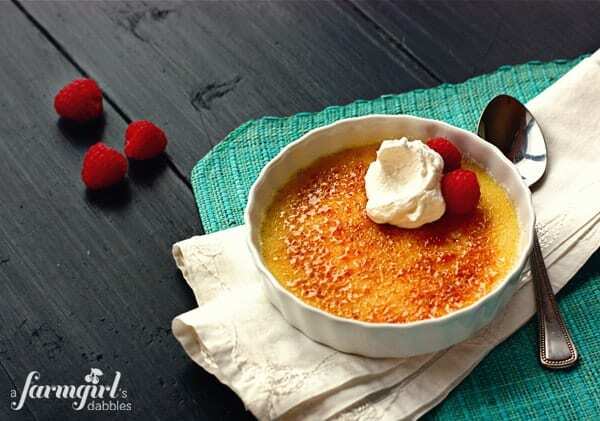 Thanks, Jan. And you’re absolutely right…the possibilities are endless with this recipe! 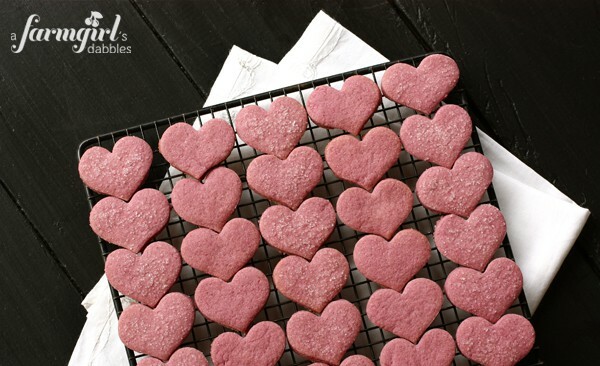 Very beautiful pink heartshape shortbread cookies you have made. Happy Valentine’s Day to you! Thank you so much. And Happy Valentine’s Day to you, too! 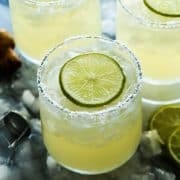 I’m bookmarking this recipe for summertime. 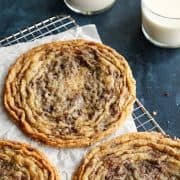 It’s really hard to find cookie recipes that aren’t full of non-local ingredients. Beyond the sugar and marshmallow cream, these could be GORGEOUS…and Minnesota-grown! 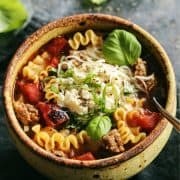 These sound and look absolutely delicious. As much as I enjoy baking, I don’t think I’d have the patience to create these. 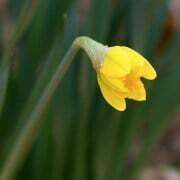 So I’ll vicariously enjoy them via your images (as always splendid) and words. 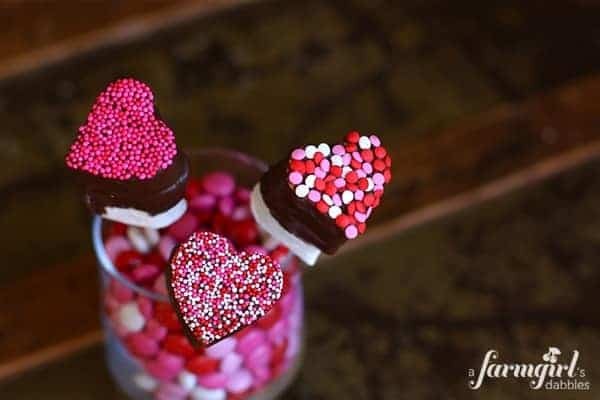 Well now I don’t know whether to make these or the marshmallow conversation hearts for Valentine’s Day! I guess we may be celebrating for a while because I had my heart set on the marshmallows but I do love shortbread! 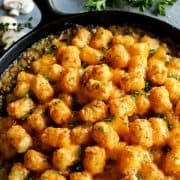 What a really fun recipe. Who wouldn’t want these? Thank you! I love anything that can be dipped – these were so much fun to eat! Thank you, Becca. These little hearts make the kitchen smell fantastic!! Seriously! These look crazy good…so purdy too! It sounds absolutley amazing. When I was little I used to mix up my own buttercream and just eat it straight from the bowl, now I think if I did that now I’d be sick but that rasberry buttercream sounds fantastic! Seriously! Be still my hear…this is such a lovely treat! Great job cutting perfect hearts Tessa. 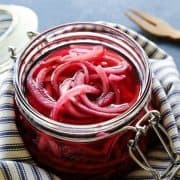 You and your Mom have such fun in the kitchen and with great results too. I rarely make shortbread myself but it is always so good, and I love that you made a dip to go with them. I’m so excited to make these! I usually just do a regular sugar cookie, but these will be taking its place. Thanks for sharing! I adore the fact that these have fresh raspberries in them. The color is just perfect! Love the pink color! Too cute! That natural raspberry coloring is the best!! Thanks, Maria.